Our brilliant lock change packages have been created to offer Doncaster homeowners the best possible prices available. Call us now to ensure your family and home are safe and secure for the future. SF Locksmith lock change packages are available to all residents in the Doncaster area and beyond. Are you moving home and looking to have the locks changed? We have packages designed specifically for you. According to a survey conducted by NOP, on behalf of insurer NIG, previous home owners have passed out many spare keys to relatives, neighbours, tenants, estate agents and tradesmen doing regular work on your home over the years. Not all of those keys are ever accounted for. We recommend performing a full lock change on all external doors, and also not to forget the garage door. This may sound expensive but our home mover package has been tailored to ensure we can offer you maximum discounts because of the multiple lock changes required. You may find that the existing locks require upgrading for insurance purposes in any case. All locks fitted will be of British Standard. The lock changes can be organised to be performed on the day you move in to give you peace of mind immediately. To find out more about this package, please contact SF Locksmith today! With locksnapping on the increase in the Doncaster area, SF Locksmith is advising everyone with euro cylinders fitted to their existing doors to seriously consider having them upgraded. If you are not sure what type of locks you have, give us a call and we will offer the best possible advice for each individual person. Unless you are an experienced locksmith, it is difficult to assess if your locks are the vulnerable type. In simple terms, the lock itself mainly consists of brass, which is a soft but non corrsosive metal. Because of how they are manufactured, there is a weak point. This "secret" has been kept quiet but with the likes of YouTube allowing people to publically publish the latest "how to" video, this knowledge is no longer the secret it was. The solution... our antisnap lock package. 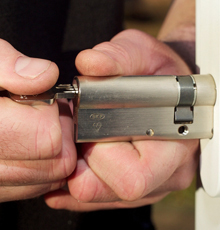 The average house has three euro cylinders fitted to the external doors and these can be swapped for three high security and high quality antisnap locks. The added bonus that comes with these locks is that they also offer antibump, antipick and antidrill protection. The price is £150 fitted, a fantastic price to consider for your future security. Additional locks cost £35 each as well. An hour and a half later the job I needed doing was done, to exactly the price mentioned in the initial phone call.